Welcome to the community's discussion page, the place to discuss any subject related to this wiki, or simply ask for help about wiki editing. This page is not a general forum about cameras or photography. To reach the greatest number of wiki contributors, topics should also be discussed at our Flickr group discussion area. To reply to a question simply click the "[Edit]" button on the right side of the screen close to the question title, and add your text below. Don't forget to sign your posts on this discussion page. To sign use the signature button on top of the editing window. IMPORTANT EXTRA DISCUSSION: see Camera-wiki.org:Flickr_Community_preservation_discussion !!! For older discussions, see the archive. 1.2 Save our Flickr photos from deletion! 1.4 Where Should We Talk? 11 Links to some website called "camerapedia.org"
18 Flickr Has Changed - How to Insert Images Now? 19 What do we think of creating a page on the Kodalite system of flashguns? Save our Flickr photos from deletion! Flickr has announced that free Flickr accounts will be limited to 1000 photos starting January 8, 2019, and that the the oldest photos beyond 1000 will be deleted starting on February 5, 2019. This affects the Camera-wiki.org Flickr group photo pool, as the photos are held in individual users' Flickr accounts, both Pro and Free. We can expect many thousands of our photos to be deleted if action is not taken. Photos that are currently on Pro accounts also risk deletion if the Pro subscription expires or if users delete their accounts. Download all photos in the Flickr group, including Flickr metadata such as identifiers, URLs, author, license, title, and caption. Contact members of the Flickr group, to ask them if they'd be willing to designate a more permissive license (e.g. the Creative Commons Attribution-ShareAlike or Attribution-NonCommercial-ShareAlike licenses), or grant a non-exclusive license for Camera-wiki.org to make non-commercial use of their group photos free of charge. Establish new image hosting for camera-wiki.org, independent of individual users' Flickr accounts. I can handle downloading the photos and contacting Flickr users, but I would like to have the input and approval of the Camera-wiki organizers before I charge ahead. Please reply with your thoughts. Establishing new hosting is a bigger question that will require more thought and planning. Photos could possibly be hosted right in the wiki, just as Wikipedia does, or in Camera-wiki's Flickr account. wiki = a technology for collaborative authoring through a web-browser interface. Used by many websites, projects, and companies for all types of content. Wikipedia = the largest and most visible user of wiki technology is the free encyclopedia Wikipedia. Wikia = the name of a private, for-profit company which hosts user-created wikis; it derives its income from advertising placed alongside this content. There are other similar "Wiki farm" companies in existence. Camerapedia = An online encyclopedia of cameras and photography begun in 2004, and hosted at the domain camerapedia.org. In January 2011 this domain was sold to Wikia, and no longer exists as such. A website with the name "Camerapedia" is now hosted through Wikia.com. Camera-wiki = the website you are now visiting. In January 2011, many of the contributors to Camerapedia rebelled at its commercial hijacking by Wikia. A splinter group duplicated Camerapedia as it then existed, and "forked" off a new project, pledging it would remain non-commercial. On February 7, 2011 this went public as camera-wiki.org. It has grown by many hundreds of pages since this split. Although having our community discussions take place on this page is "the true Wiki way," I'd like to raise the question of whether it's actually the best place for it. I know I keep beating away at this same message, but there are lots of folks in the world who potentially could be a great help to us--either with camera expertise or organizing a non-profit--but who find all this wiki-markup nonsense completely opaque and unfriendly. Many will forget to look for discussions or followup comments here, and miss them entirely (I only just figured out watchlists today myself). To reach the largest number of wiki contributors, it is advisable to start a topic at the Camera-wiki.org Flickr discussion area. If making a request to add or improve features of the wiki, also please see the Camera-wiki.org "To do" list. Going forward, I feel there are a couple of areas where Camerawiki could use some refinement. The first is pushing for a more standardized way to embed images in pages--always including the essentials of a link back to the source, identifying the contributor, and stating the license terms. The first is mandatory to use Flickr-hosted images in a way consistent with their terms of service. If you would care to mock up some dummy pages with examples of "best practices" for laying out text and images, perhaps that could be a rallying point for making gradual improvements throughout Camera-wiki. The only thing to be aware of is the Template:Flickr image, because we're attempting to enforce more consistency in image attribution and rights clarity. In my case as a total beginner, page layouts tended to be the result of random thrashing because I didn't understand the markup, and I expect that will be true for many prospective contributors who might be camera experts, but new to wikis. For photo replacements, I agree with you that in many cases authors just grabbed what was in the Camerapedia pool as of that date, when much better images might be available. My preference would always be to replace images in the event we can get 1) plain light backgrounds; 2) camera examples in better & more original condition; 3) sharper images without wacky HDR, sepia, or Hipstamatic processing. In my opinion, the "Flickr image" template is good for a single image only. Once you try to add two or three images aligned to the right or to the left, the template causes various problems. The Mediawiki table syntax is more flexible when you want to insert many images, and it is not that difficult to grasp. See for example Eder Patent Kamera, impossible to achieve with the "Flickr image" template, or this page for more complex layouts. For a beginner, it is certainly easier to cut and paste the layout of an existing page and changing the image URLs. To help with that, we might set up a help page with real-life examples taken from various pages. A short conversation in the talk page of new user Past reflections reminded me that a welcome message for new users might be not merely a friendly gesture but also something of utility. I therefore whipped up a template for the purpose. It's rather kludgy but I think it's a lot better than nothing. I like to think that its kludginess may be part of its appeal. It requires two taps on the "Save page" button, and the interval between the two not only lets the writer sign it but also lets them add something personal -- "By the way, I'm delighted to see that you're working on Kowa medium-format cameras; I still have one of these and use it every weekend" -- so that the message is more appealing and doesn't risk smelling like "unthinking boilerplate". I called the template "Welcome1" rather than plain "Welcome" with the idea that, even after it's rephrased and finessed, it needn't be the sole welcome template. Instead there could be several, allowing a choice among them. Thoughts prompted by the result of this move: This wiki lacks any "Image license" namespace. Its current name thus implies that "Image license: Creative Commons (not for commercial use)" is a mainspace article, e.g. a camera worth writing about. Ack--ditto for "Sources:", as in for example Sources: Bibliographies (and note the anomalous space after the colon). Reminder: Creative Commons and Non-Commercial are not the same - There are six types of CC licenses and only 3 restrict commercial use. I noticed several of my images have been changed from CC (creative commons) to NC (non-commercial). These are NOT the same thing. In my case I use the CC BY-SA license, which explicitly allows commercial use and derivative works. Only CC licenses that include the 'NC' designator (i.e. the CC BY-NC, CC BY-NC-SA, or CC BY-NC-ND) can legitimately use the 'nc' image rights template. It would make more sense if we had templates for each of the six types of CC license but we don't. I've updated the cc image rights template with a full explanation of the types of CC licenses and I'd recommend using it for all CC licensed images to avoid confusion. As a side note, once we get to MediaWiki version 1.19, I think I'll be able to get an automated flickr image extension working that will automatically display the appropriate license terms as indicated by the flickr API. So it's not worth making a lot of new template to solve this right now. Steevithak, thanks for this enlightening of the creative common licenses. Guess i had read somewhere that all cc's should be replaced by nc's but see that this is not the case and just a misunderstanding on my side. According to the web page ( http://www.mediawikiwidgets.org/MediaWiki ) to which you point, it's not a matter of citing but a matter of embedding. Looks like this widget has not been used to embed anything since it was added and there is now a rather large warning on the MediaWikia site saying it should be used with caution as it allows any user to embedded pages containing malware. I'm going to remove the widget for now. If we find a need for later, we can always put it back in. So what is the correct procedure for referencing or including wikipedia content? For example, the whole wikipedia page on flange focal distance is already highly developed and useful for my lens adapter project. This question has come up before. I have occasionally linked to WP, for example if I use a phrase or name that an average reader may need an explanation for, but which isn't central to our field. For example, I linked to WP in Svea while discussing the origin of the camera's name. Our page Help:Citing sources doesn't forbid using WP 'to provide context'. I just searched and found 501 links to WP! Admittedly, a lot of those are in discussions about whether and how to cite WP as a source! Sometime, I might go through some of those and see if we really have to use WP that much. Although we're both wikis, WP and CW are very different projects. One difference is the attitude to 'Original Research'. None of the information at WP should be original; so if we make a statement here that really needs a source to support it, WP isn't really the right source to cite, though we could look up the source cited by the WP article, and cite that. However, in this case, you aren't asking about using WP to support statements that might be disputed. I imagine it's the table of values that I guess you're interested in. Just because of the number of contributors, the table at WP is likely to be bigger, and new values added sooner, than ours. I can see the attraction of giving a link (and I think I'd go ahead and do it!). I see a lot of red-links in the table though! Note that we already have the pages Flange focal distance and Lens mount. Maybe you could modify those (and add a link to the information at WP if you think it helps). No, it was the Fujica G690 which was already featured in the beginnings of the project. The Fujica GW690 was just suggested as feature. 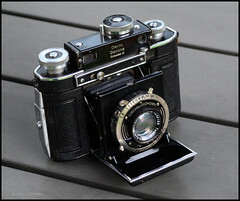 A thought occurs to a Camera-Wiki (CW) reader (or editor): "Wasn't there some German 6×9 SLR back in the 1930s?" The obvious way to locate such a beast is to get the list of all cameras here, and reduce this to an easily skim-readable size by specifying as many as are needed of the specifications "German(y)", "6×9", "SLR", "1930–1939" (and by applying these specifications in any order). It's a pleasant idea, but MediaWiki (the software used here) has no provision for this; and, to the best of my knowledge, nothing like it is in the pipeline. All of which goes to show that, curse it though we may, the category system is all we have and all we are likely to have in the foreseeable future. It may become easier to navigate -- the breadcrumb function might be added [wild guess!] the year after next -- but it would still be what's used. The following may seem self-evident, but: The more consistent the category system is, the easier it is to use. Please bear with me for an example. Over at Wikipedia (WP) the other day, I noticed the existence of the newish and [then] virtually uncategorized article "Third Floor Gallery" (a photo gallery in Cardiff). I had a vague idea of how this might/should be additionally categorized, but a clearer idea that it was analogous to London's Photographers' Gallery. So I "edited" the latter to copy its category section, pasted this into the former, made changes to the categories that seemed obvious, previewed, deleted the "red" (non-existent) categories, explored the blue ones . . . yes, it may sound terribly complicated but it probably took only five minutes. What I did not have to do was either to travel a long way up the category hierarchy in order to explore other possible directions or to do more than trivial guesswork. All of this is helped by the fact that WP categorizing is a lot more consistent than CW categorizing. This is hardly surprising, and it is not intended as a mere complaint about CW; it's a statement of (perceived) fact. And it's a fact that I propose to do something about. The first and third stages are easy. It's the second that takes time. Actually there are four stages. Above are the second to fourth; the first stage is getting agreement that what you're proposing is the right thing. After all, there are few things more infuriating than undoing some other fool's category "improvement", and (I speak from experience here) few more miserable than undoing one's own. Let's start at the top. If we go to any category of CW and go up, up, up, eventually we reach ":Category:Root category". Root at the top? Oh, right, this is a tree, and trees grow upwards rather than downwards. (Metaphorical use seems to have inverted the actual tree.) And "root" brings to mind "root access" (not to mention "root canal") and all in all is not the best name. Articulating a more logical architecture from the "top down" is indeed an important goal in improving our category system (which at present is very confusing, and so poorly maintained). But I would also like to note there are plenty of issues from the "bottom up" which also need attention. We have categories with only one member, and thus are of questionable value (I am not speaking of image-by credits, which have their own rationale). We have categories whose names are perplexing. We have a guideline that cameras should be put in the narrowest category that exists—but many articles are included in multiple levels of the same hierarchy. I don't want that less glamorous, but very necessary, work to be forgotten. I agree with most of what's above (though the 'tree' metaphor isn't a problem to me: it makes a lot more sense than 'nested'!) I see the sense of defining categories in the plural, and separating the hard-core camera content from other articles at as high a level as possible seems wise. I have often thought it would be good to decouple a camera's German-ness from it's folding-ness and its size, as Hoarier describes at the top: a mostly un-nested/treed system; more like tags' than categories. It might make sense to have some of these in parent categories (to mix up the tree metaphor a bit): 6x9 and 3x4 in 'Formats', 'German' and 'Chinese' in 'Country of origin' etc. This might make a guideline for applying the cats quite simple: for a simple camera article, you need one from this set, one from that set, and one from this other set. The main barrier to such a system is that (as far as I know) we currently lack the way to search it. There is an extension Multi-category Search that might do this well enough. It allows up to five categories to include, and up to three to exclude. The section on Purpose and usage in the page about the extension describes pretty much our situation (only for a cinema wiki). I have spent all of two minutes looking at it, so I'm not advocating it, just pointing out that it exists, and seems to be intended for exactly our problem. As Vox says, there's a lot of bottom-level work to be done correcting the categories into which individual articles have been put (even if there were no change to the system; a lot more if we do change it), and some rate of this work is bound to be ongoing by the nature of the project: any new writer will get the system wrong for a while. Whether "trees" go upwards or downwards, yes, there are indeed problems in numerous categories here, all the way down to those categories that themselves have no subcategories. On the face of it, it seems silly to have categories with only five or fewer members. These should be discouraged. However, I've occasionally found them useful. I agree with Vox that better explanations are needed, but I think that clearing up the categories themselves is a more pressing task. Wikimedia's "Multi-category Search" is very interesting news. (Thank you, Dustin.) Its talk page suggests that people have lost interest, but the history of the page itself (not the talk page) shows that updates have continued. It got me thinking, and I quickly found a page that was completely new to me, one that makes a request: "Category intersection". It makes for very interesting reading and is worthwhile just for clarifying one's own ideas of what categorizing is or should be for. What's depressing is that it has already been bubbling away for five years. What's alarming is that (A) it would require a thoroughgoing reworking of the whole of WP's categorization, while (B) it of course is an unknown until it's actually in place: might it be too much of a strain for the servers or bring delays? (I'd guess that it's this combination of (A) and (B) that deters people from working to bring it about.) we can't be certain. What's cheering is that its discussion page brings a lot of interesting suggestions. Neither the page itself nor the discussion page is very long, but there's a lot of food for thought and I can't claim to have digested it: I suggest that the three of us (and of course anyone else here who's interested) devote a bit of time and thought to what's written there. D: Anything German or Japanese is more thoroughly categorised than anything else, it seems. Often, yes. The idea is this. XYZ is a kind of thing (for example a 35mm interchangeable-lens SLR). There are lots of these XYZs. Ignoring the fact that almost everything these days seems to be made wherever corporate taxes are low and moderately skilled labor is cheap, the "nationality" of a camera is pretty salient -- people know that Asahi/Pentax is Japanese, Leitz/Leica is German, etc. Most XYZs are either German or Japanese. So when the XYZ category gets too heavily populated, hive off some of its contents to "German XYZ" etc. Such categories can always be added later: e.g. if there later are a lot of articles on French XYZs, a separate category can be made for them. D: The 'US-American' thing must be an attempt at political correctness, I think [. . .] As I hazily remember, there was disagreement on whether to go with "US" or "American", and this was a compromise that very few people liked but nobody summoned the stamina (bloody-mindedness) to oppose. Yes, it's horrible. So which is better, "US" or "American"? D: A similar problem exists with 'Former USSR'; most of the cameras categorised there weren't made in the former USSR, they were made in the USSR I can't get worked up about this, but I believe it's idiomatic to say that Leningrad was the name of a city in the former USSR. Though yes, "former" does seem unnecessary, and I too would prefer to drop it. So which is better, "US" or "American"? Unless there's some fear of ambiguity, I'd prefer "US"—just because it's more compact (and faster to type). "US" is perfectly acceptable to my ear as an adjective (e.g. "US electorate stunned by moronic behavior"). If you go to your personal preferences page, you'll now see a tab that says "gadgets" where any installed gadgets may be turned on. They have to be enabled individually for each editor. You should see HotCat listed there. If you turn it on, it adds a lot of little text icons to the category display at the bottom of the page. Aside from making the category list uglier, (not really problem since a typical user won't see it), it also looks potentially dangerous, so I'd suggest not turning this on unless you actually anticipate using it to modify categories. Thank you for the HotCat work! No we shouldn't scrap categories for manufacturers' names. As it is, both Category:Pentax and Category:Konica point conspicuously, surprisingly and delightfully to Zion and Optor. (If the article is correct, only Asahi manufactured these lenses, but luckily the category titles aren't "Products manufactured by XYZ" and so this isn't an issue.) People uninterested by these categories needn't use them, but they're easy to add (I don't know about you, but I first paste in [[Category:]] several times and then fill these in; "Pentax" or whatever is a particularly simple choice) and they're pretty easy to maintain too. Should we be holding off creating any categories for now? I have edited a few pages recently on jumelle cameras (and I know there are plenty more not yet in the wiki), and think it ('Cat:Jumelle cameras') would be a worthwhile cat, but I can keep a mental note of it if a new and better system is about to be launched. I looked at 'Cat:Detective camera' (currently in the singular) as a model; it is in 'Cat:Cameras' and has one sub-cat (of questionable usefulness). 'Cat:Jumelle cameras' would be too small to be worth subcategorising, at least for now; in due course it might be worth making subcats for mono and stereo. A division between (a) policies and guidelines for CW and explanations of how things are in it (which may be long), and (b) practical advice (which should be as concise as possible) on how to achieve this; the former to be in the "Camera-wiki" namespace and the latter in the "Help" namespace. Unless there's a powerful reason not to do this, all category titles should be noun phrases or nouns, in the plural (not "enlarger" but "enlargers"; not "folding" but [yet to be decided] "folding cameras" or "folders"). I hadn't looked hard enough: I found that [[Category:Photo-Jumelle]] already existed, with one member. I deleted it and replaced it with Category:Photo-jumelle cameras (with a small j), and have put in everything I could find that belongs. I put that cat in Category:Cameras and Category:Camera architecture. I liked your photo-mamelles. "US-American" is now history; the term is now "US". Page redirects to categories up for deletion No articles link to any of these. Any reason to keep them? ... Super This is a redirect to Category:Super with an ellipsis and a leading space. Super ... Another redirect to Category:Super with trailing ellipsis and space. ... Super ... Another redirect to Category:Super with leading and trailing ellipsis and spaces. Super Another redirect to Category:Super (somebody was really intent on alternate ways to find the Super category! Links to a page which is not the main page of a website are allowed, provided the link to the main page is given too. For example: Depth of Field at Wikipedia. This also applies to the links pointing to a single frame inside a page. Links directly pointing to an image or to a PDF document are discouraged, but may be allowable, for example if the needed document is likely to be hard to find. For a longer explanation and more details, see Wikipedia's "Help:Footnotes" (in which it's called "the Cite.php method") and "Footnotes"
again with no link to Wikipedia as a whole. I can only think a bad view of linking to PDFs dates to a time when quite a lot of people weren't equipped to read them, and/or downloading was limited and slow. A PDF link has a document icon, not the standard link-arrow, so there is automatically a sort of a warning. I have added a warning in the past when I linked to a large document. Most of the PDFs here are probably camera manuals at Mike Butkus' site and some of the camera-makers; eminently useful links. I tend to link to the preceding 'splash' page for Butkus' ones, where it (a) tells you what format the manual is in, and (b) gives his spiel about donating. There are sites where I don't think a top-page link is very necessary, though I still give one (for the first link or ref to the site in any article). I link to Early Photography quite frequently, and the link seems to give you the page you want in the context of the frame system, so you can get to anything else on the site quite quickly from the first link. In particular, the top page is linked by the site logo at the top left, just like WP and many other sites. However, clicking that logo at Collection d'Appareils gives me a redirection warning, which is always slightly annoying, so I give the page it redirects to as my top-page link, though to be honest I don't think it's a useful page to see. Yes, the last time I looked, Butkus was asking people to please please not link directly to any Good Stuff, but instead to link to its prefatory page. Well, fair enough. But surely we don't have to add a link to the top page of his site. (For one thing, most sites have a link that obviously goes to the top. For another, the slightly computer-literate know that you achieve this by deleting everything in the URL window that comes after the TLD -- e.g. here, everything after the ".org".) Yes, single images are a bit dodgy, if only because the page in which they're first embedded may present important info about authorship, copyright, and of course a factual explanation too. Sorry all—Dreamhost had a network outage which kept me from replying sooner... I have always preferred the format deeplink/at/homepage for external links, and will usually change links to that format. There are three advantages to it: 1) It allows people to quickly gauge whether the linked site is one they know and trust; 2) it is a courtesy to webmasters whose good information we are essentially borrowing when our own articles lack it—it allows them to introduce their site with whatever description or welcome they prefer; and 3) That courtesy may encourage them to add reciprocal links back to camera-wiki.org (which we badly need to improve our search rankings, which typically still have camerapedia.wikia.com ahead of us ). I wrote above Is linking to the top page necessary? / I think not, though I understand that in a very few cases it may help. All right, it is necessary. But I've slightly reworded the page on external links so that people don't feel compelled to repeat the link to the top page within any one page here. Wikipedia: Contains next to nothing about Wikipedia that would be of particular interest to readers of Camera-Wiki; and if people want to read about Wikipedia in general, then Wikipedia has a hugely better article about itself. Photographic studio: Pleasing illustrations, but this does not add up to an article, and I very much doubt that it ever will. WikiNode: for the reasons given on this page, above. I wouldn't delete Photographic studio; I see the point in such an article existing, and I think it could be improved (and needs to be, though it's not the next thing I'd spend time writing). Useful insights about how photography was done might come from an article about studios. The present article refers to false backgrounds as though this was an unusual practice, but I suspect they were the norm in some periods, and knowing that is important when you look at an old portrait. I have PDFs of one or two Handbooks of Photography from the late Victorian and Edwardian periods, some of which include guidance on layout and equipment for a studio. I'll have a look (sometime...) and see if I come up with anything to add quickly. The main picture isn't informative, and should be at least smaller, or replaced; and the text doesn't say what period it's talking about. I wouldn't weep over the loss of Wikinode; it seems an odd concept, reducing the Web to a daisy-chain; and the particular nearest neighbours chosen for us don't seem that apt. The page has been there since '05, and left alone for most of that time. User:MarkDilley was the last to pay it serious attention, almost a year ago (incidentally, I have used his Template:RightTOC thing a couple of times). There is some point in a page about WP here, but nobody needs to be told what WP is, or shown an exmple page of it (and one was shown, it probably shouldn't be the front page, which isn't a typical one). Rather, it could give guidance on if/when and how to use WP as a reference or link; which would make it (part of) a Help page. I suggested WikiNode for delete - any admin can just do it. Wikipedia is one of the major resources for any knowledge. We have the article as sample how to embed a web page by widget, and as explanation how to treat original text taken from Wikipedia - as citation. We may embed an external chat page that way in the future, too. The article photographic studio is a basic explanation to understand early photography: Where did they get the light from for early studio shots? Certainly there was a photographic era before the invention of the flashgun. And photo studios are still common locations for professional photo work. It seems there are two issues: One is whether, where, and how material from Wikipedia may be used in Camera-wiki.org. My feeling is a that plain external link is the least confusing. It's a different website! This is a policy question that needs to be settled with more discussion. In any case, whatever the advice is, it belongs in a Help page. Why is it Your obsession to kick out an article of mine? If we want to be a camera encyclopedia we need the wider view, not the narrowest, excluding all and anything which is not an article about a certain camera. We don't want to copy Mc Keown's, a pure item list, we want to handle the topic cameras as one related to photography - don't fear that, better make it true. Some professional photography people need studios and of course some studio equipment - much more can be written about that in this wiki. Keep it open, don't destroy the good idea camera-wiki. I'm sorry, I can't keep count of the colons any more. I am hardly "obsessed" with deleting Wikipedia. My top comment observes it's a little-viewed article, and that fixing other pages is a higher priority. But this is an important point: We all must be gracious in accepting criticism—especially when four active editors are basically saying the same thing: We don't need a page describing Wikipedia. And there is no agreement that we should "embed" any part of it into our own pages. (We already have too many people confusing the two websites and their similar names.) If there are guidelines for linking to Wikipedia content, they belong in the Help pages. It seems that we are getting personal. I don't want to get personal about others, but I'm happy to get personal about myself -- and also to attend to factual matters about another user. First, a reality check. We have brave Wikipedia-Admins like Hoary and Rebollo_fr among us. This EN list and this FR list show that the pitifully monoglot Hoary is an administrator in en:WP but that the enviably bilingual-plus Rebollo_fr is not an administrator in either fr:WP or en:WP. It's been one and a half years since Rebollo_fr contributed to fr:WP and a year since he contributed to en:WP. What are we discussing now? Perhaps the question of when it is desirable to delete articles. In fact, we delete pages all the time, whenever they are duplicates, or have essentially no content, or when (after discussion) several editors find them misguided. If we have an article which is sloppy or incomplete, and makes us look amateurish, it is no defense to say that articles elsewhere are bad too. It is perfectly valid to delete it. Yes a wiki is always "under construction," but even the first few boards nailed together should be straight and sturdy. Responding to a question Dustin McAmera raised above: Incidentally, is this the accepted way to announce one's desire to delete a page? I'm not criticising; it seems a perfectly good one. I think it is hard to find any single place that is guaranteed to be noticed and receive responses from all the interested parties. I suggest that one advantage of discussing deletions here is that if an article is ultimately deleted, its talk page may also disappear (I'm still unclear if that happens automatically). In any case, for some editor wondering "where did my page go?" we will have a record preserved here of what the reasoning was. Another comment on how to discuss deletions. Deletion of an article doesn't necessarily lead to deletion of its talk page, but even if the talk page were retained, people probably wouldn't think of going there. There are ways around that, too: for example, this page could point people there. Links to some website called "camerapedia.org"
By far the most prolific producer of radioactive lenses was Eastman Kodak. From the 1940s through the 1960s, substantial numbers of amateur cameras were produced and sold with thoriated (containing thorium oxide) lenses, including some of the [http://www.camerapedia.org/wiki/Kodak_Pony_828/135 Pony], [http://www.camerapedia.org/wiki/Kodak_Signet_40 Signet], and high end [http://www.camerapedia.org/wiki/Kodak_Instamatic_814 Instamatic] cameras. Today I started to recategorize a lot of stuff from "Former USSR" (which for the most part meant USSR, not areas that had previously belonged to the USSR) to the brand new category "USSR". For the most part. So I created the first three, reexamined my work, and did some re-recategorizing -- and then continued my recategorizing. It's tempting to add "Soviet companies" or similar, but as I understand it many of what are lazily treated in anglophone websites as companies were not companies, even in a socialist sense. I have vague ideas about what should be best, but didn't act on them. It's likely that some Soviet material is not categorized as Soviet, and that some material categorized as Soviet is not Soviet. Feel free to check and amend. The categories "Russia", "Ukraine", "Belarus", etc are not consistently used for material from the Soviet period. I have rather mixed-up ideas on this myself, in the meantime, I haven't attempted either to increase or to decrease their use. To keep tabs on these, I've created three categories that each have just one member: Category:Advertising and Category:Manuals (each in Category:Sources), and Category:Logos (directly in Category:Articles). I'm not at all happy about one-member categories, still less about cluttering up "Articles" with a one-member category. But I did this very much as a stopgap measure. If anyone would like to delete them, go ahead. I've been pondering a way to display the Vivitar magazine ads on their own page, though with a little more textual information about the history of Vivitar advertising. So I'll be curious what the outcome is on the Ernemann page. I'm for keeping the Ernemann pages in some form. I think it's definitely worthwhile to provide old ads for viewing but I haven't figured out how best to do that within the context of a Wiki. Aside from entertainment value, I've found old ads are often important as references for camera specifications, prices, or manufacture dates. As I've said, far too much of the content of this site is on the say-so of its contributors. When this is a matter of saying that the viewfinder window shows framelines, fine; when it's about company history, no. A few buddies from the German Olympus forum thought it would be a good idea in this day and age to have a Lens Adapter Wiki or something, where you could put all the information about what lenses can be adapted to which camera mounts, what kinds of limitations apply etc. In our efforts to avoid reinventing the wheel, we then came across Camera Wiki. Would you be partial to have this kind of info added to the pages about the individual lens mounts, like in this case Micro Four Thirds? Then again, the info would be great to have for a lot of people I'm sure. I think it's a great idea! It's a class of products we have hardly covered at all. I have posted a link to this discussion at the CW Flickr group, to get more reactions (we use Flickr to host the pictures for the wiki, and some of our discussions). You may have seen we have a simple Lens adapter page; maybe you could start by expanding that. The Metabones brand (and any other major brands) could have their own pages linked from there, where there could be a list of their individual products, which can have their own pages too, if there's enough to say about each. Note where there isn't much to say about a particular product, you can still create either a stub article or a redirect page, so that if someone searches for that product, the search lands somewhere. You could also add paragraphs to the lens-mount pages stating that lenses of that mount are served by such-and-such an adapter. That's how I'd do it, but (while we have some normal rules of conduct, mostly described in the pages linked in User:Botscura's automated message on your Talk page) you should feel free to follow your own ideas. As it says at the bottom of our edit screen, your work may then be edited by other users. Also take note of the Free Documentation License; if you write a good description of a particular device, you may well see your words reappearing elsewhere in the Web. It's good to cite the sources of your information, even if it's not available as a web-link. People here are touchy about links to commercial sites, and we usually avoid links even to useful product information hosted by dealers, with an 'Add to cart' button, but links to such information at manufacturer's sites is quite ok. Speaking of sources, some of the info would clearly be regarded as 'original research' on wikipedia, which I think they kind of frown upon for some reason... not peer-reviewed or something... how about that? For example, there's the 'official' list of supported lenses at the Metabones site, but someone at the Oly forum has tried the EF 85 f1.8 USM, which is not supported (yet). As I see it, that would be exactly the kind of info I'd hope to find in the lens adapter wiki, saving me the effort to weed through all kinds of different forums, so I hope that would be OK.
Another concern (although we just could cross that bridge when we come to it) would be info a manufacturer might find unfavourable, like an extensive list of older lenses their product doesn't work with (yet). Or such a list becoming outdated and poorly maintained. In the example you gave, maybe the claim has been made somewhere else already. If so, I think I'd give the official list of supported lenses (with a reference to the maker's site, maybe), then something like 'In addition, owner Eric Somebody reported that the EF 85 f1.8 USM, not listed above, worked correctly with the adapter.<ref>Reported in [adapterdiscussionforum.org/post1234567.htm this post] at the [adapterdiscussionforum.org Adapter Discussion Forum], April 2015.</ref>. Then what's stated in Camera-wiki isn't that the lens works with the adapter, but that somebody says it does: then it's not original research. We haven't ever been aware of a maker being unhappy with anything we wrote. I guess a lot of what we write about is long out of production, so the makers either don't exist, or don't care what we say about their obsolete cameras. However, if what you write is factual, they can hardly complain. That 'About' page advises that a certain amount of opinion is ok ('The build quality is flimsy'). Flickr Has Changed - How to Insert Images Now? So in the time I've been on Flickr, which has been since our standard image-embedding tutorial was written, it hasn't been possible to right-click on an image or thumbnail and select "copy image location," because there is no such option on the menu. Flickr doesn't want you doing that now because various users want to make it hard to download their pictures. The question is, how do I get the "deep URL" for embedding my pictures into the wiki? I can get the address of the picture in the camera-wiki pool for the "imagesource" field, but not the other URL. Have a look at my user page (http://camera-wiki.org/wiki/User:John_Kratz), specifically, the "Other Stuff" section, and look at the image URLs there. I recently added them, and had the same trouble you're describing. It ended up that I had to remove the "s" from the "https" before the "farm1" part of the URL. Hope that helps! Next replace "c2" with "farm"
Next place the number you see after "staticflickr.com/" behind "farm", in this case a "2"
Next delete that number you see after "staticflickr.com/" together with its trailing "/"
I left the older http://farm* hostnames as well but eventually we'll have to update the old image links. Once I get botscura working again, that's a task the bot can handle automatically so we don't have to. What do we think of creating a page on the Kodalite system of flashguns? It strikes me that we have pages on hot shoes and PC sockets, but almost no information about the flash sync terminals that feature heavily on a number of the most popular cameras ever, the old Kodak side-mount or "Kodalite" mount. I've never seen a curated list of Kodak flashguns for this mount, and one might be interesting to compile. Would making a page about the Kodalite system go against the guidelines of this wiki? This page was last edited on 5 April 2019, at 03:15.